This is the newest member of the Frontenac family! 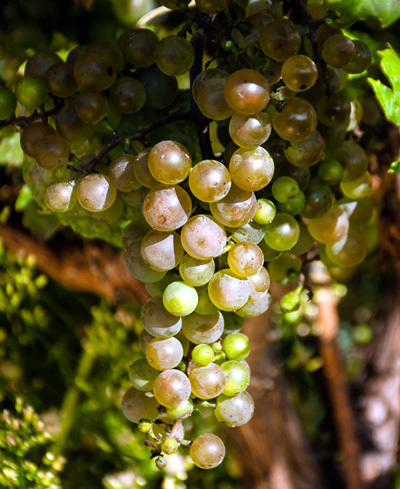 Just like the family of Pinot noir, Pinot gris, and Pinot blanc, another mutation of Frontenac has been found. In the vineyard, Frontenac blanc performs identically to Frontenac and Frontenac gris. Very productive, vigorous, immune to downy mildew, and hardy to near -36F. Berries are yellow to gold when ripe, producing a very light straw colored wine. Exposure of clusters to full sun will achieve the best aromatics. Early wine samples have been distinctly different from Frontenac gris, expressing more pure stone fruit and melon in the nose. Ripens late mid season with moderate to high acidity. Dry white blends, semi-sweet whites, late harvest, ice wines and straw wines are all possible with Frontenac blanc and Frontenac gris.